Just add the ApexLib hint $APEXLIB_V_RESIZE$ into the “Comment” property of your Page Item or the “Link Attributes” property of your Tabular Form column. in your “ApexLib – Before footer” region of page 0. I have tested this feature with IE 6.0/7.0 and Firefox 2.0, please let me know if it also works with other browsers. Thanks! 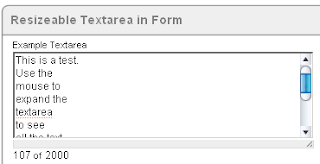 This entry was posted in ApexLib and tagged textarea, UI improvement by Patrick Wolf. Bookmark the permalink. i just tested this with Opera 9.10 and it works excellent. Would you consider having a resizable div as well? what would be the exact purpose for that? How should it behave if the text/content doesn’t fit anymore? I think the best is if you write me an e-mail for details. This works great, I really love it! to your page. Note, it has to be before the ApexLib page 0 footer region. If you need more help, contact me directly via mail.